Are you looking for teeth whitening in Bonita Springs? You could pick up a whitening toothpaste at the grocery store, but do these formulas really work? And even if they do, are they really all that safe for your teeth? You (hopefully) don’t want to exchange your healthy smile for a brighter one, after all. 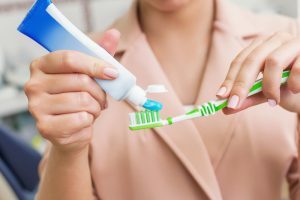 The good news is that there are a number of whitening toothpastes that have been approved by the American Dental Association are safe for use. However, they may not provide the results you desire. For a truly dazzling smile, you’ll probably need to see a dentist for a professional teeth whitening treatment. Whitening toothpastes contain special scrubbing agents that, with regular use, can gently remove stains on the surface of your teeth (extrinsic stains). These toothpastes are a good option for people who have mild dental discoloration — perhaps from a love of coffee or red wine. Whitening toothpastes cannot reach beneath the surface of the tooth enamel to remove deep intrinsic stains, though. These include stains caused by tobacco, medications, and discoloration that has built up over many years. Sensitivity: People who are prone to sensitivity to heat and cold may find a whitening toothpaste increases discomfort. Fluoride: If you use a whitening toothpaste, make sure it also contains fluoride. The mineral strengthens the tooth enamel to prevent sensitivity and cavities. To reach the stubborn stains that exist beneath the tooth’s surface, you should consider visiting your dentist for a professional whitening treatment. These can brighten teeth by up to 8 shades in as little as one visit to your dentist. You can choose an in-office or at-home kit, depending on your budget and timeline. In addition to offering more dazzling results, a professional teeth whitening treatment also protects your smile from overuse of the bleach, which can result in tooth sensitivity or worn enamel. If you choose to use a whitening toothpaste, great! Any formula that has been approved by the American Dental Association is safe for use and will help guard your smile against cavities and gum disease as well. In addition to brushing your teeth for two minutes, at least twice a day, remember to visit your dentist in Bonita Springs for routine preventive care. When you make a point to see your dentist every six months, you’re getting the professional attention that helps you fight cavities, gum disease, and other oral health hazards to enjoy a healthy smile for life. You can also discuss your options in cosmetic dentistry — and find out whether or not a professional whitening solution is right for you! The Pelican Landing Dental team is a trusted source for general, preventive, and cosmetic dentistry services for area friends and families. To learn more about your cosmetic dentist in Bonita Springs or to schedule an appointment for superior dental care, you are invited to contact the office at 239-948-2111.